Shanxi Famen Temple Cultural & Scenic Area Construction Ltd. The Famen Temple in Shanxi has over 1700 years old and houses the holy finger bone relics of the Sakyamuni Buddha. 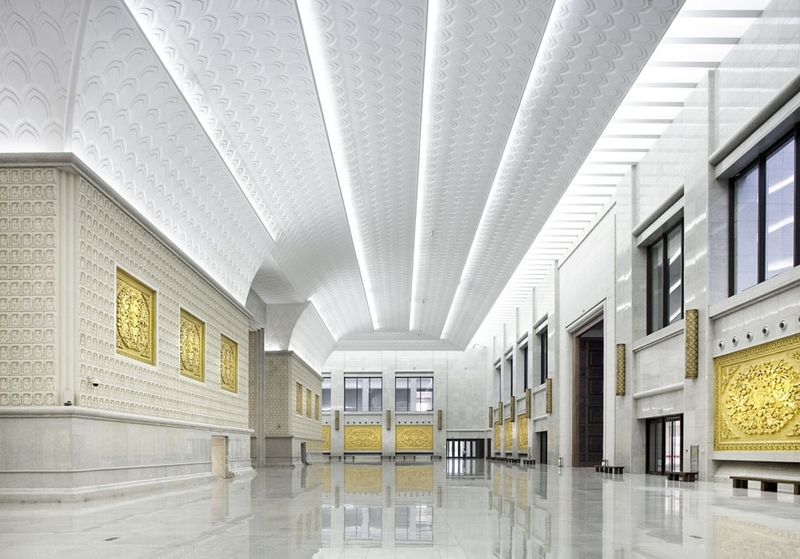 It has now quickly becoming the cultural center of Buddhism for the 21st Century. How to express the essence of ancient religious culture through the use of modern architectural vocabulary was a critical challenge for the design team. For thousands of years, Buddhist temples were always hidden deep within the mountains and forests with a pronounced sloped roof and traditional cornices that became symbolic of its role as religious architecture; its horizontal lines reflecting its congruity with the vertical lines of nature. However, the Famen Temple lies on the flat plains of central China and does not have the mountains nor hills to rely upon; thus to express its divine nature required a different approach. The traditional pagoda and Lotus seat could not adequately express the spirit of modern religious architecture. 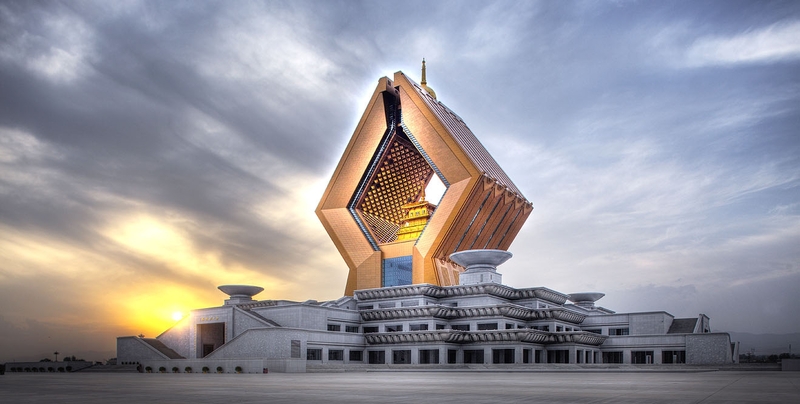 The design team spent two years attempting to distill the religious spirit to its primordial state and allow a direct dialogue between modern architectural vocabulary and the nature of faith, only then could a masterpiece be born that would impress people in the 21st Century. Ultimately, the image of palms held together in prayer was chosen by the design team in the architectural form of “Namaste Dagoba" as the perfect answer. The image of hands held together in prayer comes from those in the pursuit of faith; it is humanistic and comes from people’s needs for spirituality; it best expresses an attitude of piousness. This gesture not only resonates with Buddhists, but even those who are not can be affected; this notion of blessing resonates not only in the Chinese speaking world but throughout the world and has a calming effect. Through this cross-faith, cross-geographical gesture of greeting, we can truly manifest the power of faith. 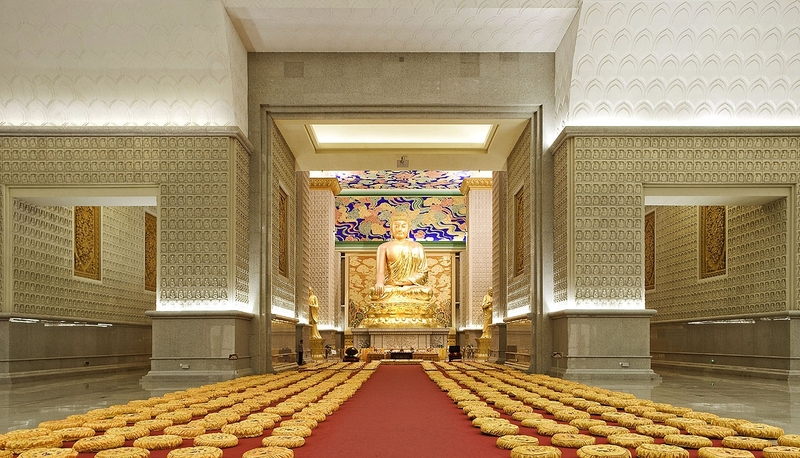 Using the gesture of praying hands as an architectural concept, not only successful recreates a model for modern religious architecture, it also echoes the purpose the Famen Temple was built over 1700 years ago to house this collection of Buddha relics. The hands of the Namaste Dagoba were deliberately designed in an upright position, the center of the palms create a space and symbolizes the beginning of life and which also houses the relics. This cleverly implies that human beings live in space, and through this gesture, derives spiritual fulfillment. At night, a strong beam of light shoots skyward from the center of the stupa symbolizing humanity’s yearning for God, filling our spiritual emptiness, praying for friends and relatives and entreat to heaven and earth. 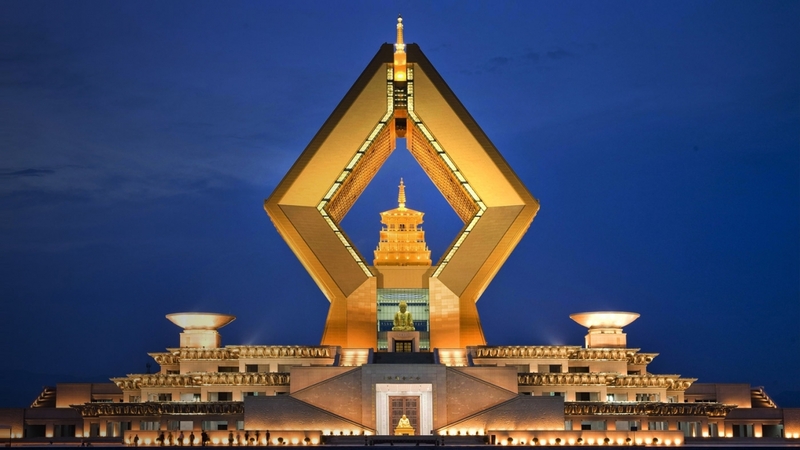 The 148-meter-tall tower, through the use of its vertical form, allows the Famen Temple, which is located on a vast plain, to be incorporated with the sacrificial rituals of architecture and belief. Visitors and pilgrims who walk the 1,000 meter long Buddha Avenue, viewing the tall stupa in the distance, will involuntarily fold their hands in prayer, sensing oneness with heaven and earth, creating a perfect union of Man and Heaven.